Is your metabolism sluggish? Are you concerned about healthy aging? If so, the four unique ingredients in ResveraCel are right for you. ResveraCel supports healthy metabolism and healthy aging. Each capsule contains ChromaDex's proprietary Nicotinamide Riboside (NR) ingredient, Niagen, in addition to Resveratrol, Quercetin Phytosome, and Betaine. The ingredients in this product are complexed with Time-Sorb, a time-release matrix. Since 1984, Thorne has set the standard for the exceptional formulation and quality manufacturing of nutritional supplements. Thorne delivers premium, science-based products, a health diagnostics technology platform, and the latest in medical education. With more than 350 products, Thorne is the most dispensed brand by 30-40 year old health-care practitioners. Thorne is dedicated to improving the health of our community as well as increasing the knowledge of nutritional health and wellness. Since 2012, Thorne has partnered with educational institutes and local charities to donate more than $1M in products and profits. Thorne products do not contain any unnecessary binders, coatings, disintegrants, fillers, or lubricants (including magnesium stearate) that could impair absorption. Thorne adheres to the FDA's current Good Manufacturing Practices (cGMPs) and has the highest number of NSF Certified for Sport products which tests for more than 200 banned substances for elite athletic competitions. Pterostilbene vs. Resveratrol Pterostilbene has been shown to have the same antioxidant potential as resveratrol in a standard assay of antioxidant potential (Trolox). However, the two methylated hydroxyl groups make pterostilbene more lipophilic and less susceptible to conjugation-induced degradation; this leads to a greater half-life in the body compared to resveratrol (105 vs. 14 minutes). These specific structural differences seem to make resveratrol more adept at combating reactive oxygen species (ROS) in whole blood and lymphocytes and pterostilbene better at targeting extracellelular ROS. * Such extracellular ROS are often responsible for tissue damage with imbalanced inflammatory response, amongst other things. As such, pterostilbene and resveratrol tend to be more complementary in their action than competitive. Work in animals has even suggested synergies between the two, along with quercetin. This is one reason both are included, along with quercetin and other components found in grapes, in a related Jarrow Formulas product: Resveratrol Synergy. Antioxidants like trans Resveratrol can help prevent cell damage caused by free radicals, which are believed to be the cause of aging and many other health issues. 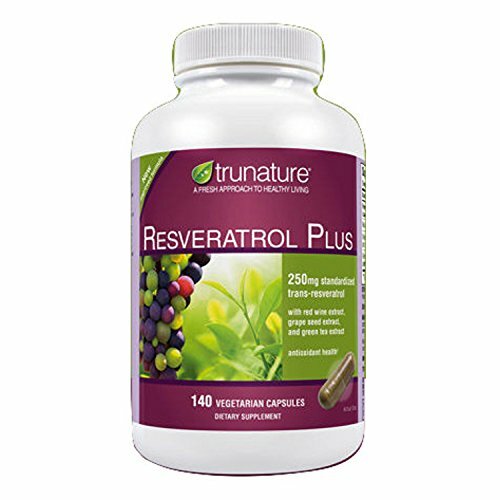 As a powerful antioxidant, trans-Resveratrol is so unique because it protects both your brain & nervous system simultaneously. The polyphenol & antioxidant ingredients in our blend include Polygonum Cuspidatum (Japanese Knotweed) , Green Tea Leaf, Acai Berry, & Grapeseed Extract, which work together synergistically to maximize the natural benefits of Resveratrol. Consider ordering 2 bottles for uninterrupted use, or for sharing with a friend or loved one. NutraChamps Resveratrol fights the signs of aging, promotes longevity, a healthy heart, immunity, and protection. Are you ready to "add life to your years"? Click the "Add To Cart" button above to experience the health benefits of Resveratrol yourself! ADD LIFE TO YOUR YEARS - Do you ever feel like the years are catching up? 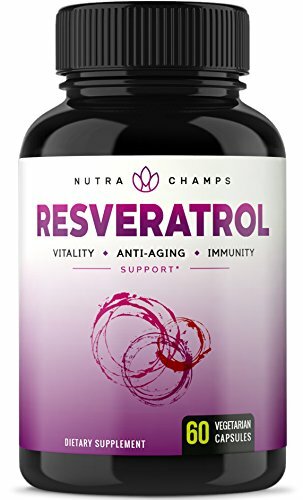 NutraChamps Resveratrol helps you maintain your youthful vigor and glow, adding "life to your years" and helping you feel better off than before you started. Customers report feelings of vitality, energy, and overall wellness. HIGHEST POTENCY AVAILABLE - Want the most potent Resveratrol on the market? Then look no further, because we've delivered just that. Unlike competitors who hide behind proprietary blends, NutraChamps contains an unmatched 1400 mg. No brand comes even close to the 600mg of PURE Resveratrol packed into each pill, topped off with 100mg of extra antioxidants! With our additional blend of Grape Seed, Green Tea Leaf & Acai Berry, you'll be guaranteed the maximum benefits Resveratrol can offer. BOOST IMMUNITY & STAY HEALTHY - While other supplements offer low quality proprietary blends, NutraChamps knows that your body needs maximum antioxidant protection to properly defend itself. Several additional ingredients in our pure & potent blend work synergistically to support immune function and maximize the natural benefits & bioavailability of Resveratrol, helping you feel great while protecting your body against the harmful infections and bacteria that can run you down. VEGAN, PURE & NON-GMO - Scientifically formulated NutraChamps Resveratrol 1400 is vegetarian, non GMO, gluten-free, and contains zero stearates, or artificial fillers. We're committed to setting a new standard of purity in the supplements industry, and you'll never find unnecessary junk or harmful chemicals in our supplements. What is Resveratrol? Resveratrol is a member of a group of plant compounds called polyphenols. These compounds are thought to have antioxidant properties, protecting the body against damage. Resveratrol is found in the skin of red grapes, but other sources include peanuts, japanese knotweed, and berries. What is Resveratrol used for? Resveratrol has gained a lot of attention for its reported antiaging and illness-combating benefits. Early research, mostly done in test tubes and in animals, suggests that resveratrol might help protect the body against inflammation. Resveratrol has also been linked to prevention of age-related problems. Research indicates that the 250 or 500 milligrams of Resveratrol commonly included in other supplements is not enough to allow you to get the most from this antioxidant. That's why we include 600 MG of Resveratrol backed up with other flavonoids and polyphenols such as pomegranate, Quercetin and green tea in our BRI formula. WHAT IT IS: Resveratrol is a beneficial compound often found in the skin of red grape seeds, juices, dates, berries and red wine, and is thought to have powerful antioxidant properties. Resveratrol is nature's way of making you feel great, boosting your ENERGY & ENDURANCE while its antioxidant properties combat free radicals, which are also the cause of aging and dull skin. It also ENCOURAGES A HEALTHY, CALMER RESPONSE TO BIOLOGICAL STRESS. Let your body and mind finally feel at ease again! OUR GUARANTEE: We're very so confident that you'll love our Resveratrol Supplement that we offer a 60-day, 100% money-back guarantee. SHARE: Consider ordering one bottle for yourself and another for a friend or loved one. Keep each other motivated and reach your goals together and more quickly. BRI Nutrition stands by every quality product we make. We manufacture only premium vitamins, capsules, pills, tablets, powders, multivitamins, supplements, topical liquids, serums, vegan foods and extracts for men, women, and children. Try BRINutrition today! Resveratrol is a beneficial compound often found in the skin of red grape seeds, juices, dates, berries and red wine and is thought to have powerful antioxidant properties. . Resveratrol is nature's way of making you feel great. Our Resveratrol supplement was formulated & designed to deliver optimal nutritional value from a variety of natural polyphenols & flavonoids that are RICH IN ANTIOXIDANTS, not just grape seed & skin! Our proprietary blend comes from WHOLESOME & NATURAL sources like green tea, pomegranate, & acai! Resveratrol helps support cognitive health, as well as your overall well-being, making it easy to take care of your body & mind! Resveratrol has anti-inflammatory properties, which can help SUPPORT HEART & VASCULAR HEALTH, with the added benefit of FIGHTING FREE RADICAL DAMAGE! Free radicals cause cell damage, which can lead to many stress or age-related diseases. Our formula can also help SUPPORT HEALTHY BLOOD PRESSURE LEVELS & DIGESTIVE HEALTH, as well as circulation! This polyphenol is able to easily cross the blood-brain barrier, promoting brain & nervous system health. This polyphenic compound can help you FEEL RENEWED with a youthful glow & vigor by boosting your ENERGY & ENDURANCE while its antioxidant properties combat free radicals, which are also the cause of aging, dull skin. It also has the ability to ENCOURAGE A HEALTHY, CALMER RESPONSE TO BIOLOGICAL STRESS - Let your body and mind finally feel at ease again! Our vegan / vegetarian-friendly capsules come PACKED with 1200mg per serving! With two pills, you can easily feel the benefits instantly. If you're not a fan of pills, you can easily take apart the capsule to mix the powder with any liquid to easily get your daily serving. We want to make it easy for you to take care of your health and well-being every day. 100% MONEY-BACK GUARANTEE - We're so confident in the efficacy and potency of our products that we back them all under our 60-DAY moneyback guarantee - completely hassle-free. Our products are made in the US and all of our facilities follow strict GMP ( Good Manufacturing Practice ) Regulations. We want you to have only the best with us so if you're not happy, neither are we! What else do you have to lose? Feel the BRI Difference today! Help Combat the Signs of Aging & Improve Overall Inner Health with these All-Natural Resveratrol Capsules. As we get older, it's not just our physical appearance that changes - our inner health can also begin deteriorating too. But by including a daily dose of this antioxidant-rich resveratrol supplement into your routine, you're helping equip your body with the support it needs to remain strong and healthy from the inside out. Helps Improve Cardiovascular Function & Immune System Longevity. As part of a healthy lifestyle, resveratrol can help not only improve cardiovascular health but also boost immune function - and even aid immune longevity! 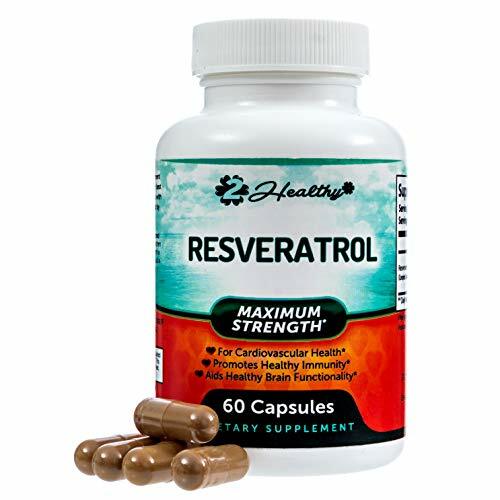 Equipping you with enhanced tools to maintain stronger inner health for longer, these USA-made resveratrol capsules will make an asset to any daily routine. Rich in Antioxidants and High-Quality Ingredients. Expertly blended with vitamin C, these capsules also contain immune-boosting pomegranate powder, acai fruit extract and grape seed extract. Working in perfect harmony together to provide the best possible support for your body, these capsules have been created using only the highest-quality, organic ingredients. Better still, every single one of these capsules is non-GMO and fully FDA-approved, giving you peace of mind you're not ingesting anything dangerous or harmful. Guaranteed Satisfaction - Or ALL Your Money Back! 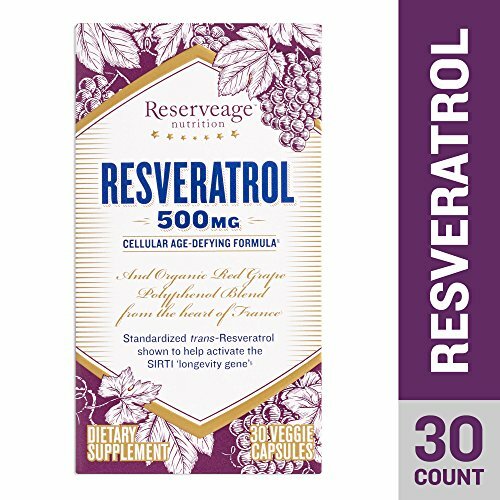 Whilst we're 100% certain you'll love the positive effect these resveratrol supplements can have on your body, in the rare event you're not completely satisfied simply let us know within the first 30 days of purchase. We'll then process a full refund as quickly as possible - no strings attached. 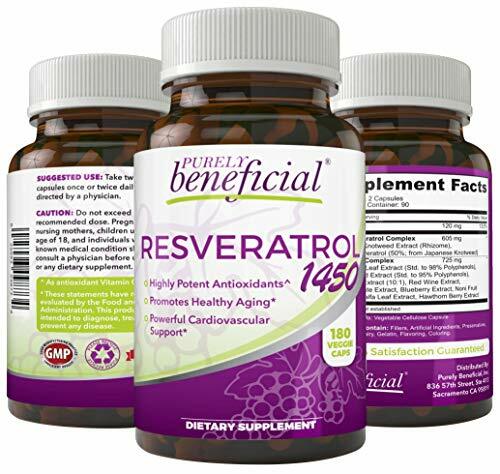 Give Your Body the Anti-Aging, Health-Boosting Support it Needs - Get Your Resveratrol Capsules Today! 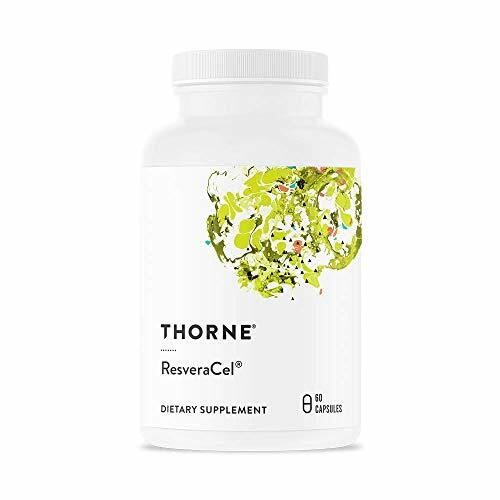 POWERFUL FORMULA: Expertly combined with immune-boosting vitamin C & fruit powders, this FDA-approved resveratrol supplement has been formulated with the highest-quality ingredients possible with no GMO's. 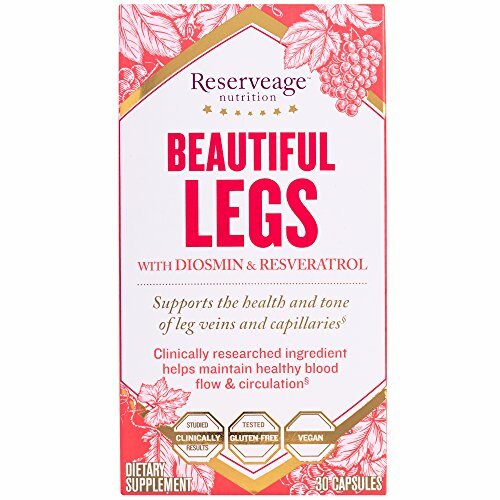 ANTI-AGING PROPERTIES: Specifically designed to combat the signs of ageing and support an existing anti-ageing routine, these organic resveratrol (reservatrol) pills can help promote a youthful feeling from the inside out. MONEY-BACK GUARANTEE: Whilst we're 100% certain you'll love the benefits these USA-made organic resveratrol supplements can offer, we'll gladly offer a full refund within the first 30 days of you're not completely satisfied. BOOSTS IMMUNE SYSTEM: Not only does this resveratrol extract help improve overall immune function, it can also aid immune system longevity to effectively fight disease for longer. SUPPORTS CARDIOVASCULAR & BRAIN HEALTH: The secret to a long-lasting bill of health is a fully-functioning cardiovascular system and alert brain function - and that's exactly what this trans resveratrol can help to provide. Want to look and feel younger? Start using the Purest Vantage Resveratrol formula today. Our Resveratrol formula is specifically designed to give you the best possible results. A potent source of trans resveratrol with added green tea extract, grape seed extract, acai fruit extract, quercetin and red wine extract. Using only natural ingredients, you get the antioxidant benefits from some of the best polyphenols available. Why our Resveratrol is the obvious choice: - 1400mg of antioxidant goodness per serving - A potent 600mg of trans-resveratrol per serving - Added polyphenol power of green tea extract, grape seed extract, acai fruit extract, quercetin and red wine extract - No added binders, fillers, preservatives or sweeteners - GMO free and also free from soy, wheat, gluten, lactose, yeast and fish - Made in the USA - Vegetarian Capsules that are easy to swallow - 60 capsules per bottle As well as all of the exciting benefits, at Purest Vantage we stand by our products and know you will love them too. SIMPLY THE BEST: Want the best resveratrol supplement on the market? Then look no further. Unlike competitors who try to hide behind proprietary blends, we are confident in our winning resveratrol capsules and show you exactly what you're getting. We include several ingredients to maximize effectiveness. 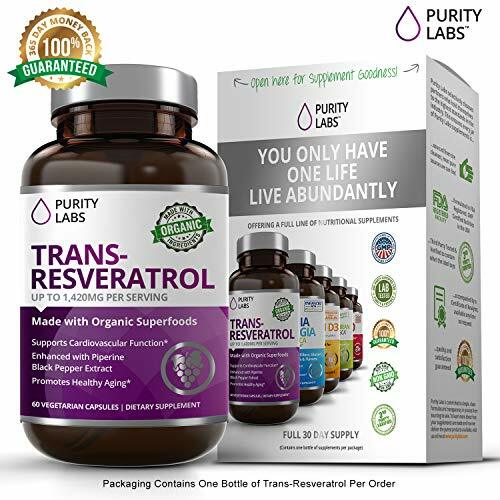 A potent dose of trans resveratrol powder with added green tea extract, grape seed extract, acai fruit extract, quercetin and red wine extract. MORE VALUE: You're getting more goodness per capsule than anyone else. Our all natural formula provides a total of 1400mg of powerful ingredients per serving (in 2 capsules). Did we mention it's also GMO free and vegan safe with no gluten, soy, wheat, sugar, binders, fillers or additives? Loaded with impressive polyphenols, our 60 capsule bottle offers unbeatable quality and value. HIGHEST QUALITY INGREDIENTS: We carefully select each individual ingredient for maximum health benefit and highest quality. All of our Purest Vantage products are made here in the USA in an FDA inspected facility following strict GMP guidelines. We are confident you will love our Resveratrol supplement. Order with confidence knowing that we've got you covered. 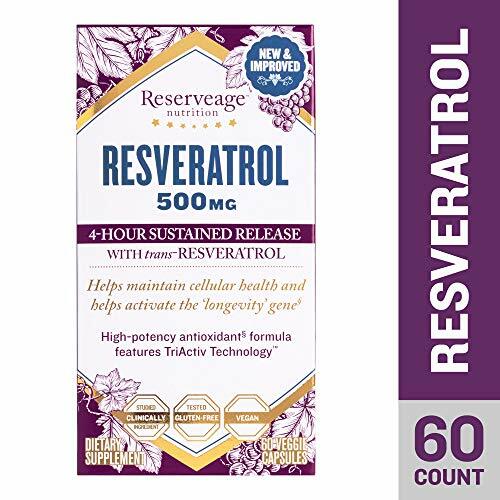 RESVERATROL BENEFITS: I'm sure you've heard people recommend reservatrol for its anti-aging benefits - keeping your body and skin looking younger for longer. But did you know, it's also being researched for supporting heart and vascular health? Not only that, some scientists suggest that transresveratrol may also protect our cells against degenerative diseases, as well as keeping our immune system healthy. GET THE ANTIOXIDANT BOOST YOU NEED: Polyphenols are a great natural source of antioxidants. Trans-resveratrol is one of the most well-known, and is available as powder, capsules, powder, pills or tablets. But we also have the added antioxidant benefits of green tea extract, grape seed extract, acai fruit extract, quercetin and red wine extract. All these powerful ingredients combine to form one of the most potent antioxidant supplements available. WHAT IS RESVERATROL? Resveratrol is an antioxidant naturally found in seeds, grapes, red wine, and other plants. Trans-Resveratrol has been linked to improved cardiovascular health, nervous system functioning, memory performance, weight management, and beautiful hair and skin. HOW DOES IT WORK? Our proprietary Trans Resveratrol blend contains a potent concentration of Trans-Resveratrol in levels high enough for the body to experience its beneficial effects. 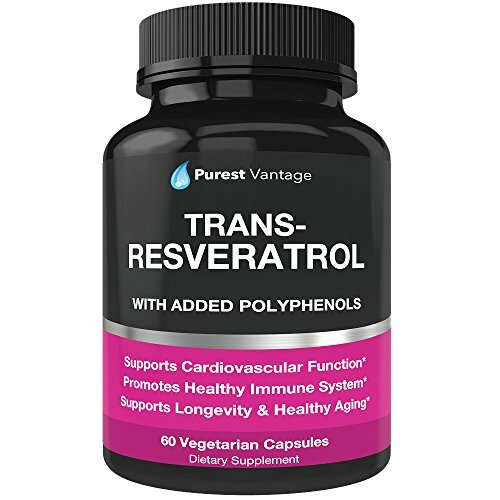 By delivering highly concentrated levels of antioxidant polyphenols alongside Vitamin C and a powerful proprietary blend of pomegranate, acai, grape seed extract, and green tea, you can enjoy all of the benefits of trans-resveratrol with added polyphenols without adding calories or alcohol to your diet. BUY FROM THE BEST: We source our Trans-Resveratrol from high quality Japanese Knotweed and perform stringent third-party purity and standardization testing to ensure safety and potency. Beware of inferior products that contain extraneous fillers, artificial ingredients, or potentially harmful preservatives and GMOs. Abundant Health supplements are always formulated in GMP compliant facilities and are made in the USA. DEDICATED TO YOUR SATISFACTION All of our products come backed with our 365-day Empty Bottle Money Back Guarantee! If you are unsatisfied in any way, simply send us your empty bottle and we will refund your purchase in full, no questions asked! Click the Add to Cart BUTTON to try Resveratrol Ultra RISK FREE! 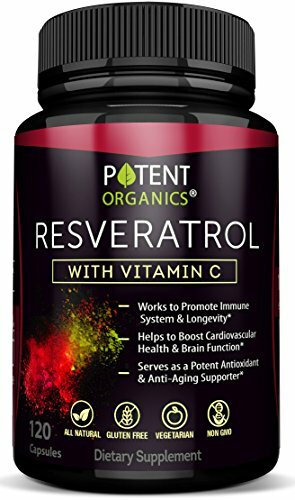 HIGHEST POTENCY RESVERATROL BLEND: In addition to packing over 500mg of Highly Concentrated Organic Resveratrol, each vegetarian capsule contains powerful antioxidant Vitamin C and a potent proprietary superfruit blend of Pomegranate, Acai, Grape Seed, and Green Tea to support healthy skin. ALSO Contains Black Pepper for MAXIMUM ABSORPTION. EASY ADDITION TO A HEALTHY LIFESTYLE OR WEIGHT CONTROL PLAN: Advanced anti-aging supplements deliver Resveratrol without adding calories or alcohol to your diet. SCIENTIFICALLY FORMULATED FOR MAXIMUM QUALITY: Abundant Health goes the extra mile to ensure our supplements have passed extensive third-party quality control tests before being bottled and sold. We use only GMP certified manufacturing facilities in the USA. PREMIUM TRANS-RESVERATROL ULTRA: Pure, potent formula supports cardiovascular, joint, and nervous system health. 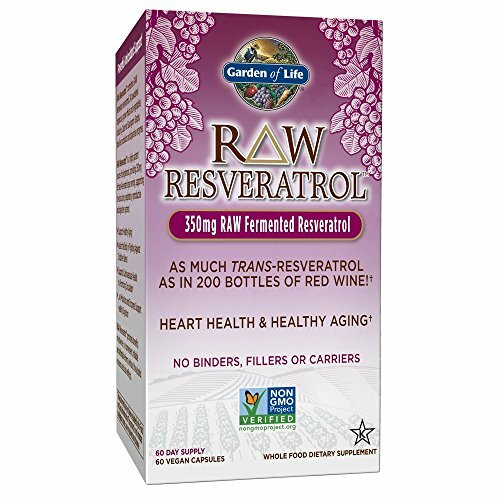 Garden of Life RAW Resveratrol is a powerful, whole food resveratrol formula, combining RAW fermented resveratrol, 23 RAW organically grown fruits and vegetables, including Cabernet Sauvignon Grapes, plus live probiotics and digestive enzymes. A synergistic blend of bioactive phytonutrients with a wide array of beneficial cofactors, RAW Resveratrol supports antioxidant activity, heart health and healthy aging. RAW Resveratrol is a highly potent source of polyphenols, providing 350mg of trans-resveratrol per serving--as much trans-resveratrol as in 200 bottles of red wine--supporting numerous systems, including the circulatory, respiratory, reproductive and digestive systems. 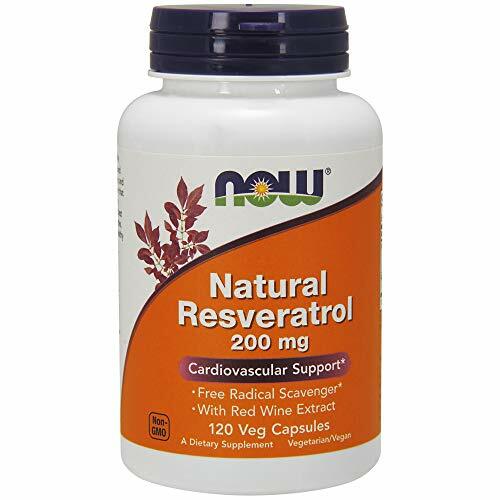 RAW Resveratrol is a RAW, fermented, whole food formula designed to provide you with powerful antioxidant support for a healthy heart. Raw, Vegan, Gluten Free, Dairy Free, Live Probiotics & Enzymes, No Binders, fillers or carriers. 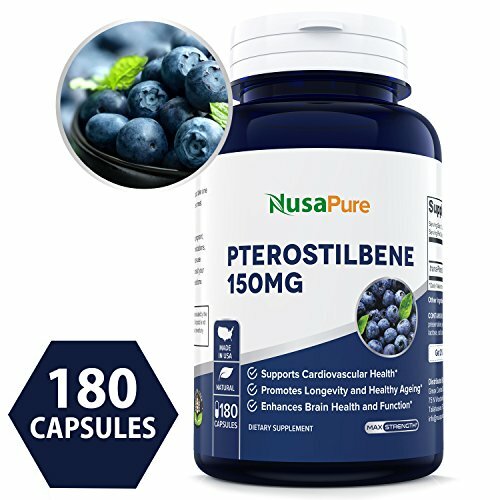 Best Pterostilbene 150mg 180 Caps (Non-GMO & Gluten Free) - Promotes Healthy Aging and Longevity - Better Than Resveratrol - 100% Money Back Guarantee - Order Risk Free! 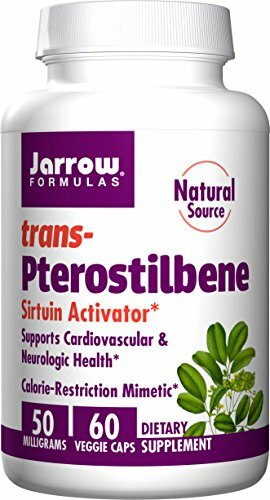 Pure & Natural Pterostilbene 150mg is a fantastic, pure source of (trans-)pterostilbene, a known natural antioxidant that is shown to have various health benefits. Pure Pterostilbene is Clinically Proven! Some research even indicates that pterostilbene may promote healthy dopamine levels in the brain - which can help you improve your mood, accelerate learning and boost your memory. 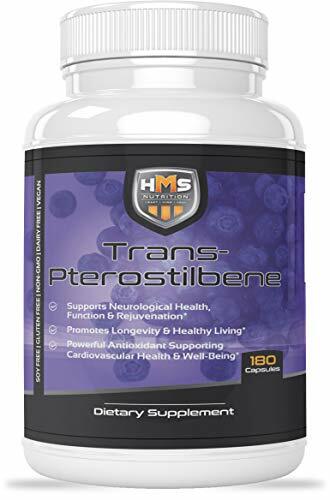 100% NATURAL ANTIOXIDANT NON-GMO SUPPORT & DNA REPAIR - Pterostilbene has been shown to minimize oxidative stress on cells, combat free radicals, and have anti-inflammatory effects. Similar to an improved version of Resveratrol, this compound has been shown to keep DNA in good repair, preventing DNA damage and promoting longevity! PROMOTE HEALTHY BLOOD SUGAR LEVELS - Pterostilbene supplementation may promote normal glucose and triglyceride levels. It is associated with upregulation of PPAR expression, and may be effective for facilitating healthy blood sugar. SAFE & EFFECTIVE - At Nusapure, we make sure that every single capsule, tablet , and pill is full of the highest quality ingredients available on the market. All of our supplements are 100% safe and follow GMP compliance standards. WHAT IS RESVERATROL? Resveratrol is an antioxidant naturally found in some plant products like grapes, seeds, red wine, and cocoa. 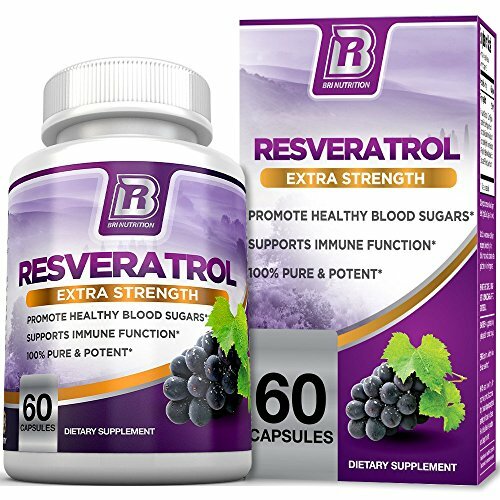 Studies have linked Resveratrol to improved cardiovascular health, nervous system functioning, and motor control, while other studies have suggested that Resveratrol may improve memory performance and its anti-oxidant properties supports to reverse signs of aging, fight free radical damage, providing skin repair, and overall health! Harvard Medical School researchers are saying they have confirmed that compound resveratrol does provide anti-aging benefits. The study, which was published on March 8 in Science, shows that resveratrol stimulates production of SIRT1, a serum that blocks diseases by speeding up the cell's energy production centers known as mitrochondria. By delivering our Resveratrol in highly concentrated levels of antioxidant polyphenols alongside Vitamin C and a powerful proprietary blend for maximum absorption, Now you can enjoy all of the benefits of Resveratrol without adding calories or alcohol to your diet. We source our Resveratrol from high quality sources and perform stringent third-party purity and standardization testing to ensure safety and potency. Beware of inferior products that contain extraneous fillers, artificial ingredients, or potentially harmful preservatives and GMOs. Vital Nutrition supplements are always formulated in FDA approved cGMP compliant facilities and are made in the USA. All of our products come backed with our Money Back Guarantee! If you are unsatisfied in any way, simply send us your empty bottle and we will refund your purchase in full, no questions asked! Click the Add to Cart BUTTON to try Resveratrol RISK FREE! THE VITAL NUTRITION DIFFERENCE- 2000mg of resveratrol for maximum proven results! YOUR BEST VALUE- Our Resveratrol has been formulated to provide a mega potent 2000mg blend of pure Resveratrol Extract in every serving. This is the purest, most potent Resveratrol Extract on the market! SO MANY BENEFITS- sourced from the purest, ultra premium, polyphenol-rich Resveratrol from berries and grape skin, it is formulated to deliver a strong, anti-oxidant boost to naturally maintain your ageless appearance and youthful vigor while also supporting your all-important cardiovascular, joint, and nervous system health! 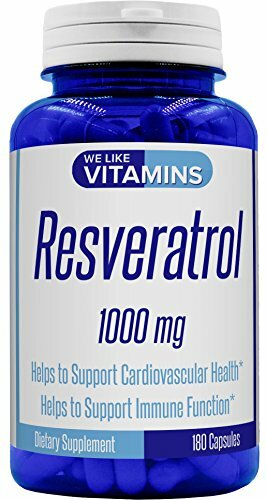 RESVERATROL EXTRACT- want a premium, super potent anti-oxidant boost to fight aging, control inflammation and improve cardiovascular health? Our ultra pure Resveratrol provides a polyphenol-rich anti-oxidant boost you need to reverse aging, fight free radical damage and improve health! 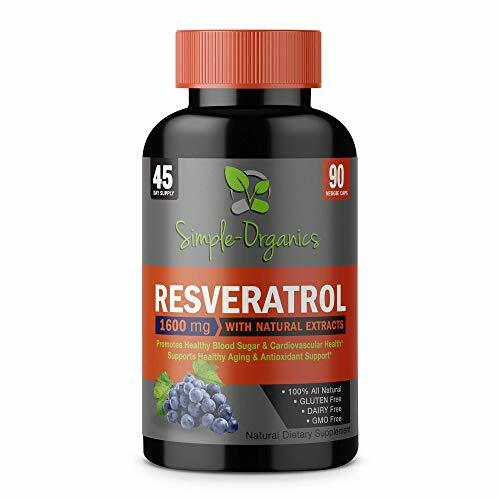 Resveratrol, also known as Japanese knotweed or polygonum cuspidatum, is a vital super antioxidant naturally found in seeds, the skin of grapes, red wine, and other plants. This product has a Probiotic Blend of 200 million Resveratrol reduces inflammation and improves cellular, digestive, immune, nervous system and heart health, it promotes anti-aging, natural weight loss, reverses the signs of skin damage and boosts mood and energy levels. Research shows that 100mg, 200mg, 250mg, 500mg and even 1000mg mg of Resveratrol is NOT enough to get the maximum nutritional value from the supplement. That is why our Probiotic Resveratrol is optimized with 1200mg (the most recommended by doctors - 1500mg and 2000mg is not effective) using a proprietary superfood blend of Polygonum Cuspidatum , grape seed extract, green tea, acai, pomegranate, probiotics blend ( Lactobacillus helveticus, Lactobacillus planetarium, Lactobacillus rhamnosus, Lactobacillus acidophilus, Bifidobacterium lactic, Bifidobacterium bifidum). 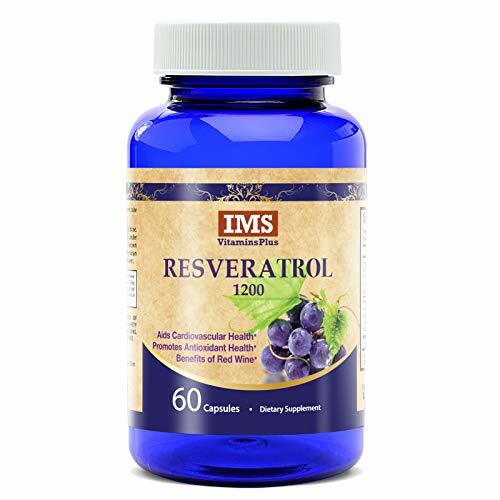 It is the best and most effective Resveratrol supplement on amazon! Resveratrol. Just to set the record straight its Res-Ver-A-Trol. Here are some common mis-spellings: resvertatrol, reservatrol, reserveratol, resverotrol, resvetrol, reversetrol, reversotol, revesterol, resveratral, resverstrol, resviratrol, revesratrol, resvitale, reserveage, reservage, rez-v and rezveratrol. Resveratrol is nature's way of making you feel great. Try our extra strength Resveratrol 1200 mg today. 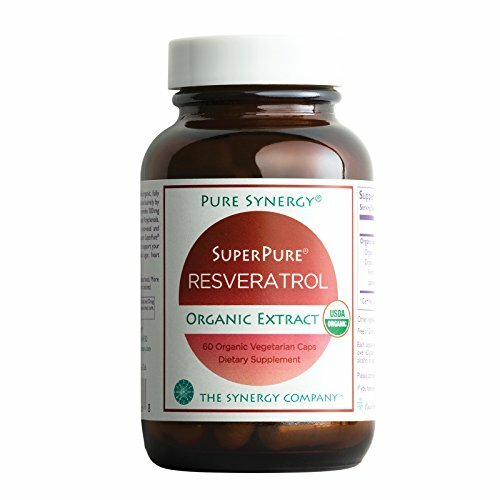 SuperPure Resveratrol is the first truly verified organic, fully standardized Resveratrol extract of its kind --- developed exclusively by The Synergy Company. Resveratrol is the well-studied nutrient from red wine behind the French phenomenon of low heart disease rates despite high consumption of fatty foods. Just one capsule daily of our extract provides 100 mg of organic trans-resveratrol and 150 mg of organic polyphenols. Derived exclusively from organic Japanese knotweed and organic red wine grape skins, our whole-spectrum SuperPure Resveratrol is a true antioxidant powerhouse to support your healthy aging, balanced metabolism & blood sugar, heart health, radiant skin, and much more. Discover the proven longevity and healthy aging effects of resveratrol. Support for healthy, radiant skin, cardiovascular health, metabolism and blood sugar, cell and DNA health, and much more! A 100% Natural dietary compound and a strong antioxidant having both preventative and therapeutic benefits naturally found in blueberries and red grapes. It is structurally similar to resveratrol, a compound found in red wine, but Pterostilbene has higher bioavailability, exhibiting increased lipophilic and oral absorption, a comparison of 80% to resveratrol's 20% making it the wiser choice. What are the benefits of pterostilbene? 100% Money Back Guarantee - we stand by our products! RESERVE makes the feeling of youthful living last. Your health should never be compromised. Reserve is a powerful dietary supplement that supports your body's ability to fight free-radical damage. Featuring a delicious blend of five superfruits, plus heart-friendly resveratrol, aloe vera, green tea and grape seed extracts, Reserve provides antioxidant support, day in and day out. 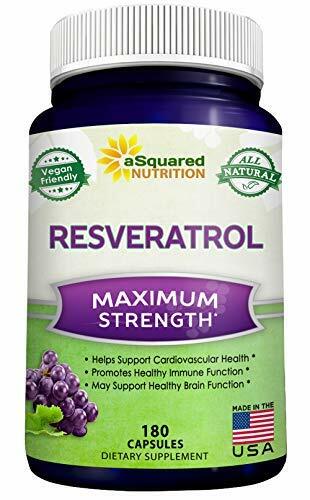 MAX POTENCY RESVERATROL: Nature's Nutrition Resveratrol Supplement is used to improve cardiovascular health, naturally help to prevent the signs of aging, support your joint & nervous system. Our high potency Resveratrol antioxidant promotes overall health and well being. 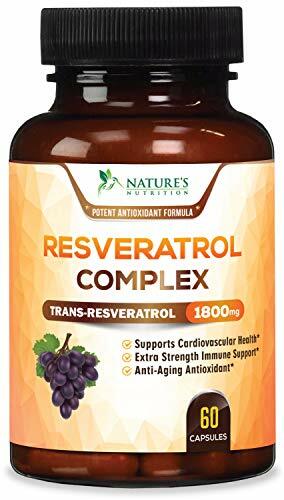 RELATED: resveratrol capsules organic trans resveratrol 1000 1000mg 1450 2000mg 250mg 500mg anti aging benefits best buy care cholesterol coq10 cream cvs dosage dr effects extension extract foods good grapes health highest japanese knotweed life longevinex loss mg most natures nutrition omega pills plus polyphenols powder q red reserveage resveracel resvida reversatrol revestrol shoppe side sinatra skin sources supplement supplements thorne topical vitamin weight wine. Life Extension has combined its cruciferous vegetable complex with trans-resveratrol based on indications from published scientific literature that resveratrol may be the most effective compound for maintaining optimal health and promoting longevity. The whole grape extract contains a spectrum of polyphenols naturally found in red wine, such as proanthocyanidins, anthocyanins, and flavonoids. Help maintain healthy hormone levels. This heart-healthy formula delivers three Mediterranean botanicals that help maintain healthy cholesterol levels and provide antioxidant support. 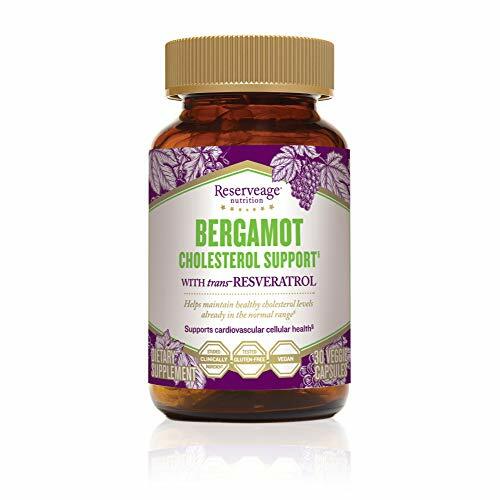 This product is intended for individuals who already possess healthy cholesterol levels and is designed to help maintain healthy cholesterol levels already within normal range. THRIVING SUPPORT: Combines three Mediterranean botanicals to help maintain a healthy range of cholesterol levels. ITALIAN BERGAMOT: Sourced directly from the exotic citrus fruit to support cardiovascular health. HEALTHIER INGREDIENTS: Completely Gluten-Free, Vegan, and made with Non-GMO Ingredients. PRO-LONGEVITY BLEND: Keeps your radiance shining bright by helping neutralize the aging effects of free radical damage. 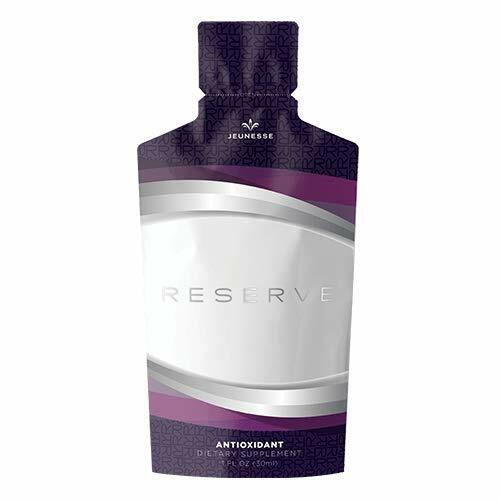 Reserveage Nutrition's Resveratrol 500mg delivers antioxidant protection in our proprietary blend that combines the finest wildcrafted Japanese Knotweed Extract (Polygonum cuspidatum) (Standardized to 500mg resveratrol-trans) combined with organic French red wine grapes and organic Muscadine grapes, along with Quercetin for enhanced bioactivity. Our award-winning Pro-Longevity Factors Blend is designed to support and help activate the SIRT1 'longevity gene', provide cell rejuvenation and offer important antioxidant protection. Each capsule is standardized to contain 500mg of resveratrol-trans and is free from unnecessary fillers. Just as red wine has different varieties of grapes, fruits and flavors, so does our super Resveratrol. 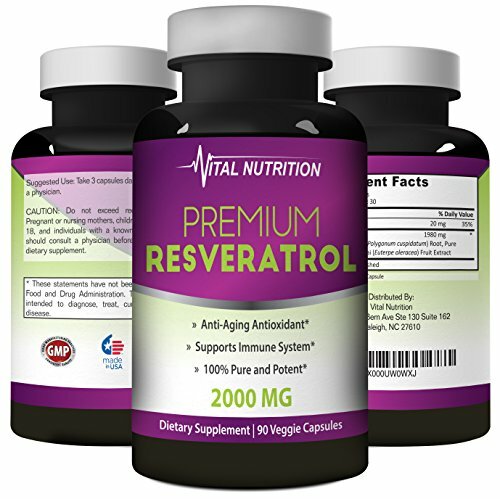 Resveratrol is formulated and designed for maximum effect. We use only the best ingredients designed and formulated to deliver optimal nutritional value. Call us crazy but we do not just want to stuff a bunch of grape seeds and skin into a capsule. Resveratrol is a beneficial compound often found in the skin of red grape seeds, juices, dates, berries and red wine, and is thought to have powerful antioxidant properties. Resveratrol is nature's way of making you feel great. NATURAL FORMULATION - No unnecessary fillers, binders, or potentially harmful preservatives or GMOs means no unwanted side effects! We use FDA registered and GMP compliant manufacturing facilities in the USA. Our formula is in capsule format, not to be mistaken for resveratrol compound in softgel, powder drink, tablet pill, liquid oil drop, chewable chews, serum gel drops, cream caps, tincture, and gum gummies. PURITY - We use only the finest ingredients, all of which are manufactured in our US, GMP compliant, state-of-the-art, facility. Every batch is laboratory tested for quality assurance. Grapeseed extract capsules bergamot nicotinamide riboside nmn nicotinamide mononucleotide acai berry cleanse.